Glimpses of a few Peruvian villages | Where to next? 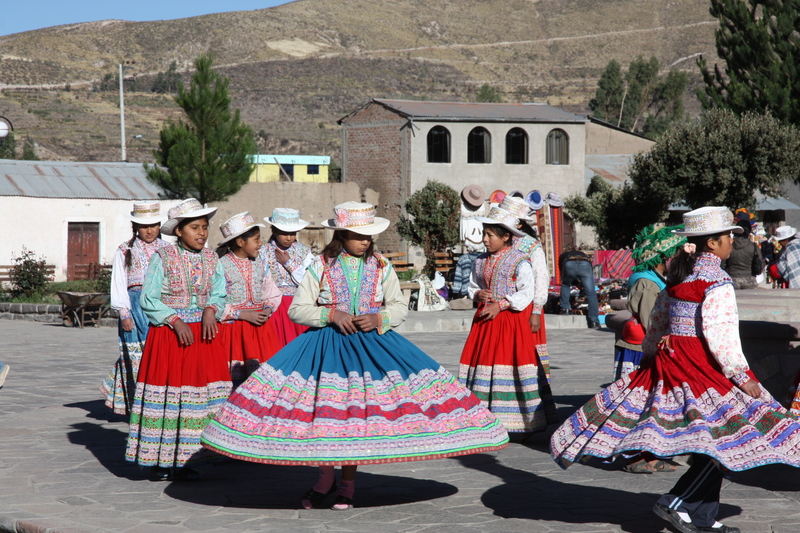 Our drive from Chivay to Colca Canyon to see the condors included stops in several Peruvian villages. There’s no doubt these villages are geared up for the morning tourist trade. We set out from Chivay about 6am and reached the first village, Yanque, not long afterwards. Yanque was up and ready for our arrival with a group of schoolgirls (accompanied by several village dogs) in the main square doing a dance to celebrate—our arrival, I suppose. The churches were open too and we visited ones in Yanque, Achoma and Maca. In all the churches, it was interesting to see the statues of saints decked out in local dress, including hats typical to the region or the dominate culture. One female saint had four names embroidered on the skirt of her red gown—Rod, Charly, Samuel and Walter. I’m guessing either she or her gown was donated by them or in their memory. The kiddies and their llamas were out in force too. 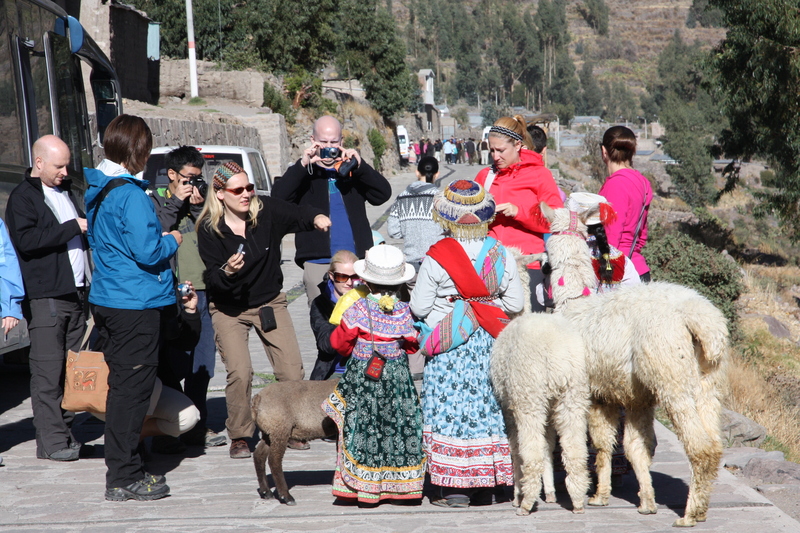 Tourists, especially those with limited time in the country, find such villages are great places to have their pictures taken with a decorated llama and kitted out child. Luckily, we are in South America long enough to find other, less staged opportunities. Every village had an army of souvenir sellers too. All the gear is pretty much the same—belts, bags, scarves, hats, gloves, knick knacks and soft toys—but the array colours always draws my interest. The legitimate early risers were the farmers. They were out plowing. 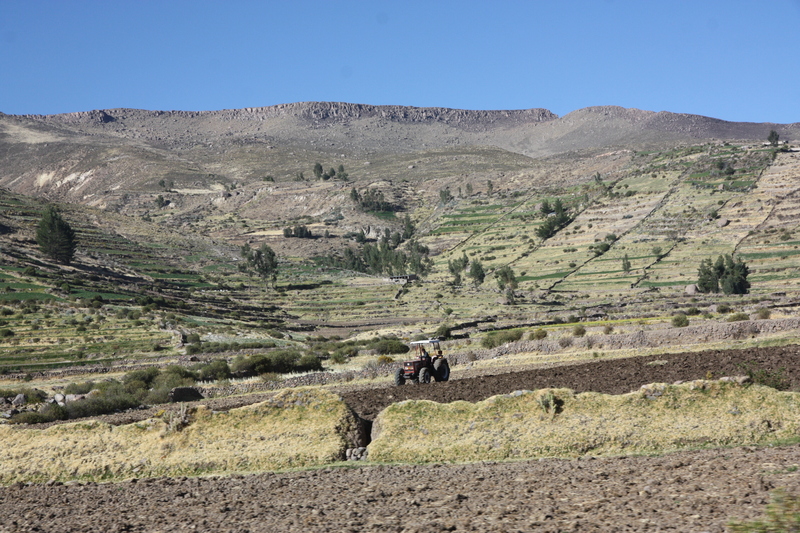 The countryside around Chivay and the Colca Canyon varies from flat to very hilly. It was interesting to see the mix of lush broad, flat fields and the heavily terraced hills that are planted to potatoes. After running the gauntlet of villages—we arrived about 8:30am, along the thousands of others, to see the magnificent condors of Colca Canyon. A couple of hours later, we went back to Chivay through all the same villages. The places were deserted and everyone had gone home. Obviously, tourist duty was over and it was back to normal life. The Rod-Charly saint reminded me of a very amusing painting hidden away in Cuzco Cathedral — which in itself is difficult, since the painting is a huge canvas. But I guess they are a bit embarassed by it. It was done in the 17th century by a local native painter who had never been out of the area. His idea of the Last Supper was thus that Jesus and all the saints were enjoying a large plate of … roast guinea pig, the non plus ultra of local cuisine, no doubt, at the time!!! We saw that wonderful painting tucked away in a corner of the cathedral. Had hoped to get a pic, but cameras are not allowed and the church minders were out in force. 😦 The plaque now says they think the main course is a wild chinchilla rather than a guinea pig. I wonder how they could tell the difference?